Vienna Carvalho-McGrain, Julia Lisuzzo, Andy Phelps and William St. Jean. RIT will recognize four faculty and staff alumni with the Golden Brick Award at this year’s Faculty and Staff Alumni Breakfast and Golden Brick Awards Ceremony. The event starts at 8:30 a.m. on Thursday, Nov. 16, in the Gene Polisseni Center Lobby. The award ceremony will take place from 9 to 10 a.m. following a complimentary breakfast. For more information and to register for the event, go to https://alumni.rit.edu/s/1624/index.aspx?gid=1&pgid=3612&crid=0. 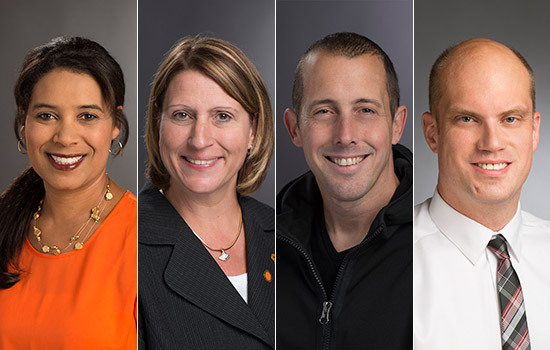 This award recognizes faculty and staff alumni who have gone above and beyond their duties to volunteer on campus or serve in volunteer leadership roles for RIT. Laura Masse, senior associate director of chapter programs for Alumni Relations, said that the recipients of this award embody the RIT-for-life culture and embed it into their daily lives. “People view giving back to their RIT community as an investment. Not only are they acknowledging what RIT means to them, but they are investing in the future and students they work with every day,” said Masse. Kim Slusser, associate vice president of Alumni, Parent and Annual Giving Programs, will be speaking at the event ceremony honoring the four recipients. “RIT wouldn’t be what it is today without its committed faculty and staff. We all come together each and every day, giving generously our time, talents and expertise. The annual Faculty and Staff Alumni Breakfast and Golden Brick Awards Ceremony is an opportunity to personally thank and recognize a special group of employees—our faculty and staff alumni—for the many ways they make their mark on RIT and our students,” said Slusser. Vienna Carvalho-McGrain ’12 (human resource development), associate director, University Communications, Marketing and Communications: Carvalho-McGrain is a proud alumna that bleeds RIT-orange. She has dedicated 20 years to University Communications covering a diverse set of beats including student affairs, the College of Liberal Arts, NTID, the MAGIC Center, Simone Center and more. Carvalho-McGrain has also served as editor for the award-winning Athenaeum newsletter. Working behind the scenes, her sunny disposition and professional nature have helped her connect with both faculty in her office and many leaders across campus. Julia Lisuzzo ’08 (MBA), director of operations, Marketing and Communications: Lisuzzo has done much volunteering on campus. She was instrumental in reinvigorating the RIT Faculty and Staff Alumni Chapter and has served as chapter lead of RIT’s Staff Council several times. Lisuzzo is incredibly happy and proud to be a part of the RIT family as an alumna. Andy Phelps ’99 (information technology), professor, director of the RIT MAGIC Center: Phelps actively works to change the way RIT students perceive and engage with their college experience. He helped create the game design and development undergraduate and graduate programs, helped found the School of Interactive Games and Media and established the RIT MAGIC Center with former RIT President Bill Destler. Phelps is leading the new MAGIC Spell Studios, a program through the MAGIC Center that encourages students to engage in business start-up activities related to digital media, and had advocated for a new facility for the program, which is now scheduled to open in the fall of 2018. Phelps wants to keep engaged with the RIT community and is actively involved with alumni, faculty and current students working in game production and ownership roles in local game companies. He works hard to make positive change for students and alumni at RIT, and is adept at spreading the RIT brand throughout all of his work. William St. Jean ’06, ’08 (human resource development), associate director for Campus Programs, Center for Campus Life: St. Jean is highly dedicated to RIT and shows it in many ways, including dedicating his time and energy to the university. St. Jean is an advocate for students and shows his support as an adviser and faculty member by helping organize and run as many student-oriented events he is able to, even on the weekends. St. Jean’s colleagues can always count on him to help with their questions or at an event. He is often described as the embodiment of what it means to be an RIT Tiger. Over the 15 years he has been working at RIT, he has built a reputation as a generous, passionate and dedicated staff member and alumnus. He lives, breathes and bleeds RIT, and gives back to his alma mater whenever and however he can.